Scalloped potatoes with a gooey cheese sauce and dishes filled with rich creamed spinach are standards on every winter holiday menu. But in summer, all that heavy dairy can weigh vegetables down. When the craving for comfort food strikes in warm weather, why not whip up a casserole that makes the most of summer produce instead of the loaded-with-cream Thanksgiving versions? This veggie-packed dish serves a family of four and is filled with the best of what's in season right now: zucchini, squash, corn, beans and tomatoes. A secret ingredient — Greek yogurt — is used instead of heavy cream to add body and a tangy flavor, minus the high fat content. And Greek yogurt is high in protein, so it helps fill you up and keep you satisfied. 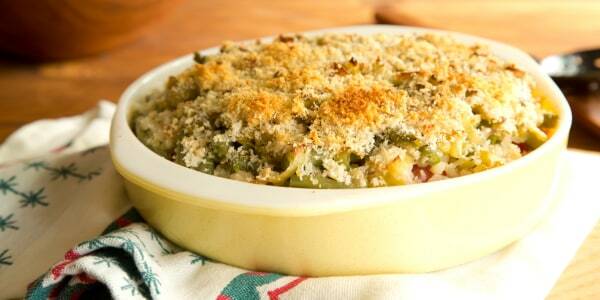 Plus, the casserole is still topped with that crunchy, savory breadcrumb crust we all can't get enough of. It's also a versatile template for using whatever produce you have on hand — substitute sliced bell peppers for tomatoes, try a layer of carrot slices, or even add a few handfuls of peas.